Get ready: It's the return of the Green Goblin! And this marks the beginning of an extended run of appearances that will form the strip's earliest ongoing mystery - one that won't resolve until the departure of Steve Ditko in 1966. A couple of commenters in the discussion of #14 pointed out the obvious comparison that I entirely missed: namely, that the character's terrifying grin recalls that of main Batman baddie The Joker! And this similarity might have crossed the minds of Lee & Ditko too, as they her start to reposition the character as the archenemy he would go on to be. Note, for instance, how they've already upgraded the villain's mode of transport from his previous (and laughable) "flying broomstick" to the much more successful Goblin Glider. Perhaps they realized they needed to shy away from the Halloweenesque elements, if they wanted to focus on making him a truly menacing character? And yet: The Goblin's first weapon of choice this outing is still "an electrically-charged toy FROG". 'Nuff said! even Stan can't keep Peter's girls straight. This issue, constant aggravator Flash Thompson surprises Peter Parker (and the readers!) by forming a local Spider-Man Fan Club. Since said club impacts the plot of this issue pretty heavily, it's perhaps worthwhile to take a moment and explicitly ponder the question: What unconscious gains are had by the choice to have Flash be such an enthusiastic fan of Spidey? Well, it's undeniable that Peter has always craved a certain amount of adoration and praise - remember that one of the first things he did upon gaining his powers was to go on television, lured by promises of fame and money - but instead he's usually met with suspicion and scorn. (Note the contrast with this issue's guest star Johnny Storm, whose exploits as the Human Torch do indeed net him the kind of easy life and worldwide praise that Peter envies.) Notice too that this development taps into the eternal hope of the lonely and misunderstood child, that "they'd like me if they only knew who I really am!" - a fantasy of wish-fulfillment that goes right to the heart of the secret identity itself, and provides ample hook with which many readers could self-identify. The irony, of course, is that Peter is thus able to receive a degree of affirmation from his peers, yet it doesn't actually change anything for his social life or public persona. Finally, Flash's hero worship allows for an increasing depth of character than the one-dimensional boor we met in the earliest issues - showing us that he has the depth of insight to see that Spider-Man isn't the "menace" the Daily Bugle make him out to be, and giving him a heroic role model to look up to, admire and try to emulate. Flash Thompson: The best frenemy a guy could ever have. Near the start of our tale, Spider-Man notices a gaggle of costumed ne'er-do-wells fleeing along a rooftop and jumping into a waiting 'copter. He immediately races after, and apprehends them in the course of their getaway ... whereupon he's extremely chagrined to find that he's only interrupted the filming of a motion picture, and the "villains" are just actors! The scene is slightly contrived, yes - would he really get that far along without a glimpse of the cameras filming? - but also oddly familiar. Hasn't Stan used this very scenario once before, and rather recently? (The eerily strong sense of deja vu would suggest so, but I can't quite place it.) Clearly Stan is enormously enamored of the movies, as they pop up in these pages far more often than either television or radio - and recall their use in other notable stories, such as Namor's own movie studio in Fantastic Four #9, or the convoluted scheme involving the fake film shoot in the Green Goblin's first appearance, just three months earlier. It's no surprise that Stan would leave the publishing biz behind and move to California as soon as he reasonably could! The main plot of the issue concerns Flash's decision to hold the first meeting of the Spider-Man Fan Club at the Avenue Dinner Club - complete with special appearance by Spider-Man! - and what happens when the Green Goblin crashes the party. Fortunately for the readers, what could have been a humdrum affair is actually pretty darn exciting! Critically speaking, this doesn't appear to be down to any one narrative strand, but rather because Stan & Steve have set up a bunch of different elements at the club, and then juggle our attention from one to the next, letting them all come into conflict with each other as they will. For instance, J. Jonah Jameson has requested the presence of Peter as Bugle staff photographer, but gleefully watches to see Spider-Man fail. Betty Brant has come with Jameson, but since she's been jealous of the attention Liz Allan has been paying to Peter, Pete doesn't want her to see him there (and especially under Liz's unasked-for affections). Johnny Storm's girlfriend Dorrie Evans is fed up with him always hogging the glory of others, and makes him swear not to steal the spotlight ... which puts him in an awkward position when he begins to wonder if the attack by the Green Goblin really is just part of the show, as the audience first thinks, or is instead all too real. The primary dilemma - that both Spider-Man and Peter Parker are expected to attend the same event - is obvious, and would certainly have fallen flat on its own, but is quite successful as the dramatic backdrop against which all the other concerns play out. 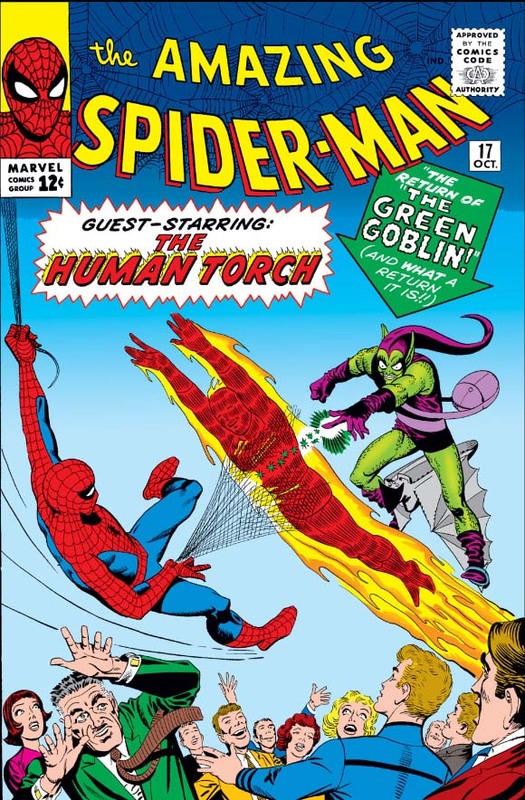 Even the eventual Human Torch team-up adds to the thrills, which really indicates what an exciting and effective Torch solo strip might have looked like, rather than the bland effort we've consistently gotten in Strange Tales. And then, in the midst of all that, Peter receives the terrifying news that Aunt May has suffered a heart attack too! Readers of the time, upon reaching that last page, must surely have felt they'd gotten their money's worth, and then some. Of all the lame excuses Peter's had to use ... that might be the worst.